Growing up, I always wondered about different genders. I was curious and after talking to different people, I learned that there are some really alarming misconceptions about transgender people. Especially in Pakistan, they have long been denied basic human rights and are usually seen as “different”, abnormal, lowly, dirty and mere objects for entertainment. I was really young when I first encountered a transgender individual yet I remember it so vividly. This incident was as normal as any other daily interaction but there is still something about that moment that I find really bizarre. We were staying at our grandmother’s place during summer holidays and one afternoon, we decided to sneak out to visit the local shops. After a short stroll, we returned and were trying to sneak back into the house. One of my cousins was climbing over the wall to jump inside and open the main gate for the rest of us when we heard a loud shriek and clap behind us. Dressed in bright and blingy clothes, there stood a rather good-looking woman asking for money. This woman also seemed to want to help us sneak in. My cousin managed to open the gate and we rushed inside. I thought we had a near escape because had the woman spoken more, or rang the doorbell, the adults in the house would have eventually found out we were not at home. But to my surprise, one of my cousins said that the appearance of this transgender was a punishment from God because we tried to deceive our family. He was genuinely frightened. I always wondered why he was so afraid. I guess this mind-set stems from the misrepresentation of transgender individuals in our society. If not all, at least a major chunk of the credit goes to Lollywood movies for always demeaning the transgender community and showing them either as villains, victims or entertainers at birthday parties or weddings. It is only recently that we have started to see some refreshing concepts and real portrayals of transgender persons in movies, dramas and now in comics as well. 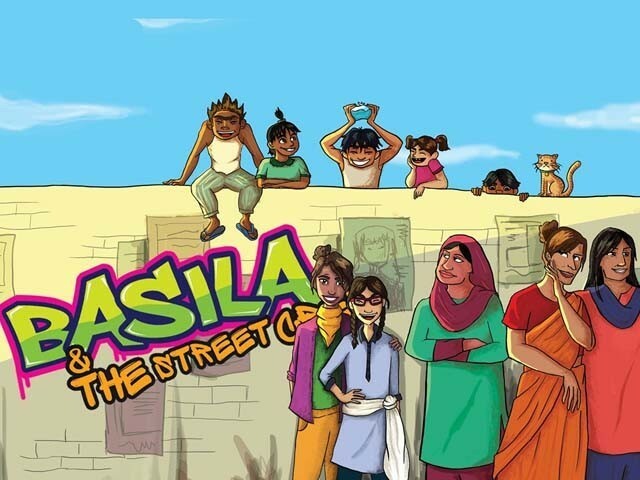 Basila & The Street Crew, the latest project by Azcorp Entertainment, narrates the story of an orphaned girl who is being raised by a transgender mother. The protagonist of this comic book, Basila, is from the Makrani community and witnesses different social issues like child labour, animal abuse, and kidnapping. After a tragedy which results in her parents’ demise, the transgender community rises up to their civic responsibility and adopts Basila. Basila is a fighter and her past doesn’t dampen her spirit and will to fight injustices. She becomes a graffiti artist and starts painting walls with messages of love, peace and harmony. In her journey to self-realisation, she is lovingly supported by her adoptive mother and her aunt, Riffat Apa, both belonging to the transgender community. The support and love she receives translates into her becoming a responsible citizen. She pledges to support other young people who are suffering and starts teaching homeless aspiring artists through the medium of graffiti art. What is refreshing and different about this comic book is the real and human portrayal of the transgender community. The writers have tried to depict transgender persons in everyday roles without trying to glorify, victimise or demonise them. Their efforts are commendable, more so, because we have seen the media (local and international) either erasing or misrepresenting their community. One may wonder why we should worry about the depiction of these marginalised communities in the media. The answer is that the way they are portrayed in the media, and especially the mainstream entertainment industry, has an enormous impact on how society perceives them. Almost two decades later, I still haven’t forgotten that moment. Why would a child/ young person think of another person as scary because of their gender? I feel, apart from a few brilliant dramas like Shanakht by Mehreen Jabbar or movies like Bol by Shoaib Mansoor, our generation has never really seen the human angle of transgender persons’ lives. This is why this comic book is so essential today, especially in a community like ours where minorities are constantly side-lined. I for one cannot wait for its release.